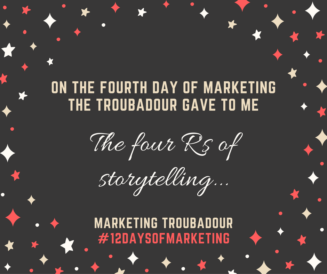 On the fourth day of marketing, the Troubadour gave to me FOUR Rs of storytelling. If your story is RELEVANT and RESONATES with them, they will RELATE to you and REMEMBER you. We are hard wired for story, it helps us connect to each other and gives meaning to our lives. It’s important to remember that when marketing our business, we are marketing to humans. It’s OK to use emotion in telling your story, story helps us relate to our audience. It’s also OK to get a little personal, after all, nobody else can have the same story as you. Think about it – the combination of mission, experience, products & services, approach, and expertise gives you a unique story that only you have. Own it, use it, believe it, and people will remember you.